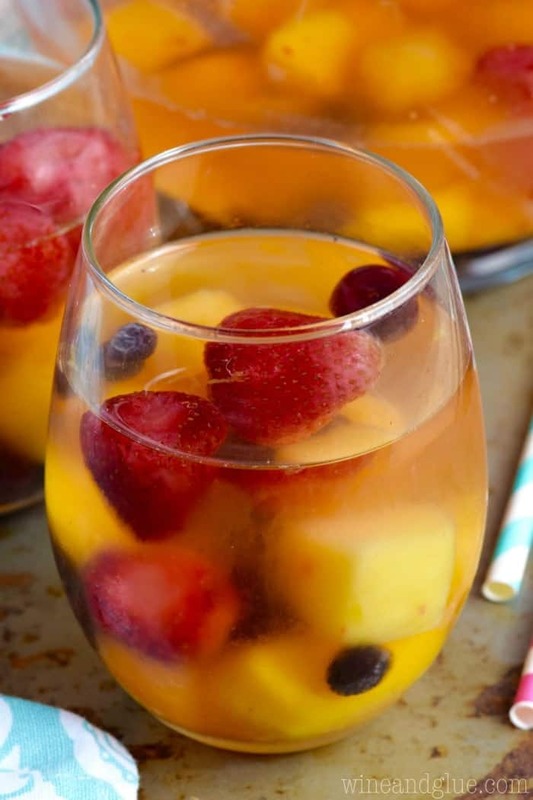 This Frozen Fruit Sangria is a simple formula that makes it EASY to make a whole pitcher of sangria for a party. You’ll use this OVER AND OVER! I think when I first started blogging, and in the beginning it was really just crafts, the idea of recipe development was terrifying to me. The idea that people could come up with ingredients that when they threw them together they tasted like something real and delicious seemed like straight up witch craft. And now I LOVE IT! I’m not sure how it changed or why it changed, but it totally changed. I’m sure it was just a matter of overcoming those fears and going for it. And looking back I can’t believe that I felt that way about cocktail recipes! I mean, those are really the easiest to develop! Booze + More Booze = Awesome. AmIRight? Or AmIRight?? And Sangria is for sure the easiest of the cocktails! 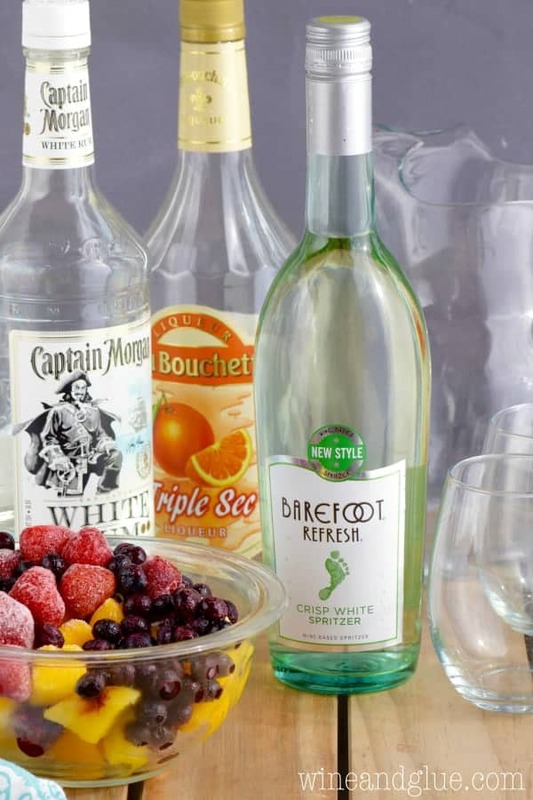 Once you realize that it’s a basic formula of wine, alcohol and fruit the possibilities are totally endless. 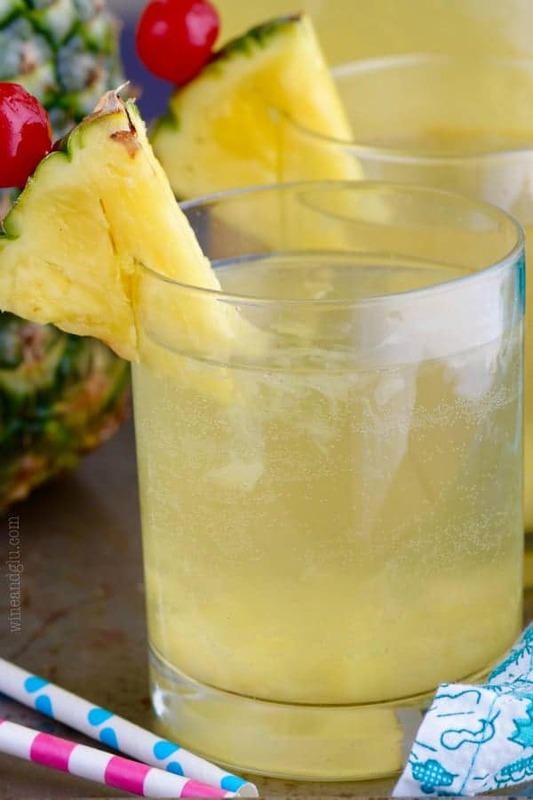 I love taking traditional flavor combos and making them into a sangria, like with this Pina Colada Sangria. And I love even more taking something that’s a little less traditional but totally works together and making THAT a sangria, like this Strawberry Basil Sangria (SO GOOD!). It really is that simple. 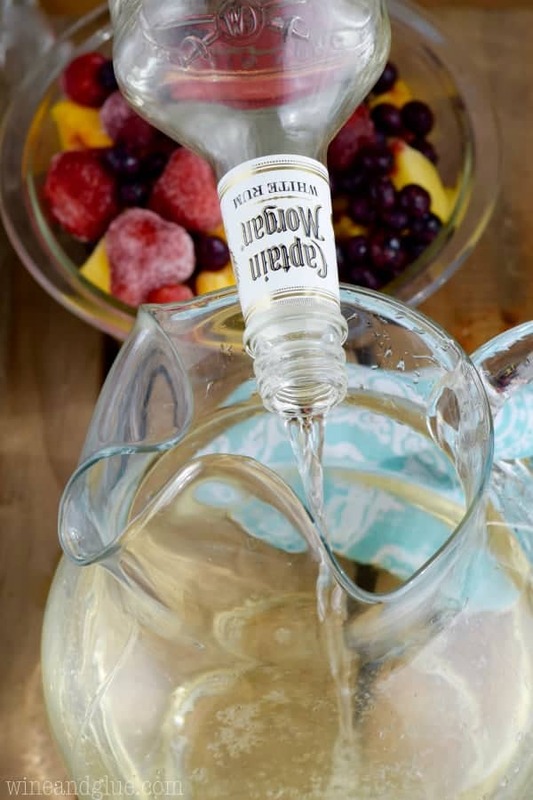 And once you buy the other liquor that you need, you will have them on hand and you can make pitchers of this over and over all summer long. It’s last minute, it’s fast to throw together, it’s perfect! So! Start with a bottle of white wine. I like a spritzer. You know, bubbles. Then add a little white rum. A secret? 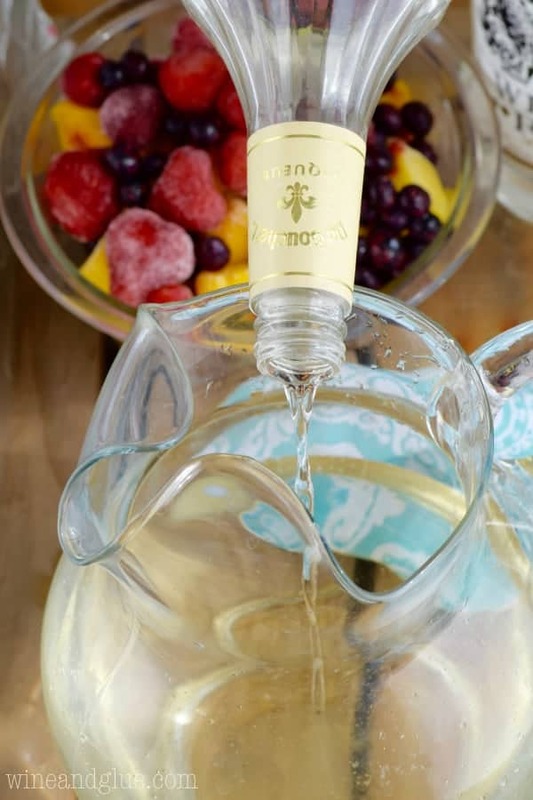 Switch the white wine to red and the white rum to brandy and you have a whole new sangria. BAM! Did I just blow your mind? Now you add some triple sec. This adds a little punch of orange and sweetness. You want to go fancy? You could totally add some Cointreau. I love it! Next you add some frozen fruit. I added about three cups worth, but you don’t even have to measure. And it can be whatever is in the freezer for your kids’ smoothies. I swear I won’t tell them what you did with it when they ask for their very favorite Raspberry Mango Smoothie. This batch had strawberries, mango, cherries (I love frozen cherries) raspberries, and blueberries. It was awesome! If you look at my sangria recipes they are all very similar. There are slight deviations on this basic formula. 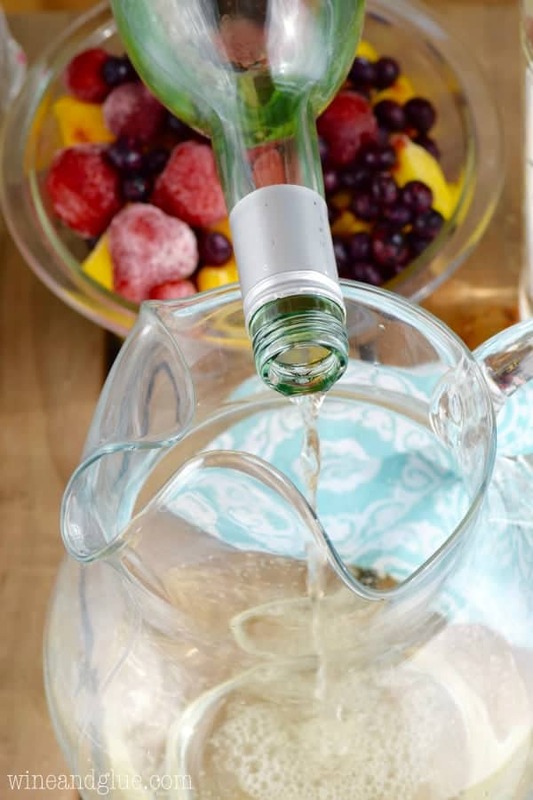 I know that the idea of spending the money on alcohol is daunting when you have never tried a recipe before, but even a “bad” sangria recipe isn’t bad. People. It’s still sangria. Have fun with it! Combine all ingredients. Stir. You can serve immediately or for a more intense fruit flavor let it sit for a few hours in the refrigerator. 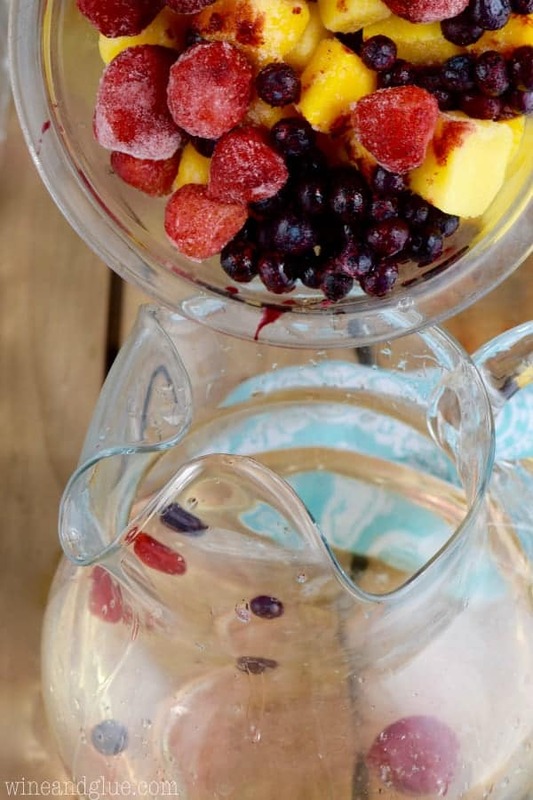 You can use any combination of frozen fruit that you have in your freezer. Certainly there are fruits that go better together than others, but there is no bad option here. This is the smartest, most genius recipe EVER. I cannot wait to use it all summer long! I love this post. Pinning! I tend to shy away from sangria because it seems like work…but clearly with your tips on the frozen fruit thing it’s not much work at all. Thank you!! 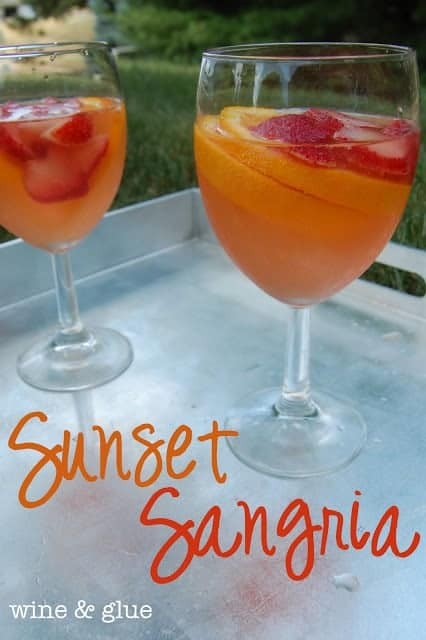 For the Pina Colada Sangria, can Proseco be substituted for the Moscato? I already have it, trying to save a trip to liquor store (although I am sure I can find something to buy!). If you love Proseco, I’m sure it would be great in this! 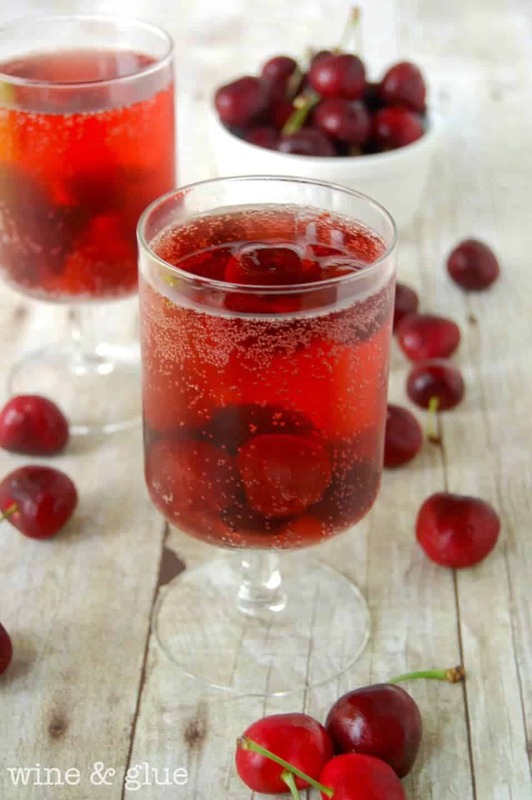 Thanks for share I need recipe awesome for drink so cool enjoy it ??????? ?